This is a delicious light salad that is perfect as a complete summer or fall meal. The sweetness of the apples and grapes and the crunch of the California almonds make this a wonderful tuna salad for brunch, picnics, and more! Mix together, tuna, grapes, apples, celery, mayo or Miracle Whip, almonds, and lemon juice. Add salt to taste. Serve over greens, on artisan bread, croissants, or with crackers. 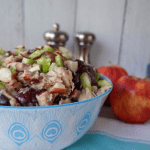 This is the best tuna salad made with apples and grapes!